After Andrew had stayed with Jesus and had learned much from him, he did not keep this treasure to himself, but hastened to share it with his brother Peter. Notice what Andrew said to him: "We have found the Messiah, that is to say, the Christ." Notice how his words reveal what he has learned in so short a time. They show the power of the master who has convinced them of this truth. Andrew's words reveal a soul waiting with the utmost longing for the coming of the Messiah, looking forward to his appearing from heaven, rejoicing when he does appear, and hastening to announce so great an event to others. To support one another in the things of the spirit is the true sign of good will between brothers, loving kinship and sincere affection. 9 because, if you confess with your lips that Jesus is Lord and believe in your heart that God raised him from the dead, you will be saved. 10 For man believes with his heart and so is justified, and he confesses with his lips and so is saved. 12 For there is no distinction between Jew and Greek; the same Lord is Lord of all and bestows his riches upon all who call upon him. 13 For, "every one who calls upon the name of the Lord will be saved." 14 But how are men to call upon him in whom they have not believed? And how are they to believe in him of whom they have never heard? And how are they to hear without a preacher? 15 And how can men preach unless they are sent? As it is written, "How beautiful are the feet of those who preach good news!" 16 But they have not all obeyed the gospel; for Isaiah says, "Lord, who has believed what he has heard from us?" 17 So faith comes from what is heard, and what is heard comes by the preaching of Christ. Fly from bad companions as from the bite of a poisonous snake. If you keep good companions, I can assure you that you will one day rejoice with the blessed in Heaven; whereas if you keep with those who are bad, you will become bad yourself, and you will be in danger of losing your soul.
. . . And then, I tell God everything that is in my heart. I tell Him about my pains and my joys, and then I listen. If you listen, God will also speak to you, for with the good Lord, you have to both speak and listen. God always speaks to you when you approach Him plainly and simply." 3 and many peoples shall come, and say: "Come, let us go up to the mountain of the LORD, to the house of the God of Jacob; that he may teach us his ways and that we may walk in his paths." For out of Zion shall go forth the law, and the word of the LORD from Jerusalem. 4 He shall judge between the nations, and shall decide for many peoples; and they shall beat their swords into plowshares, and their spears into pruning hooks; nation shall not lift up sword against nation, neither shall they learn war any more. 6 Pray for the peace of Jerusalem! "May they prosper who love you! 7 Peace be within your walls, and security within your towers!" 8 For my brethren and companions' sake I will say, "Peace be within you!" 9 For the sake of the house of the LORD our God, I will seek your good. The divinely inspired Scriptures affirm that the Word of God was made flesh, that is to say, he was united to a human body endowed with a rational soul. He undertook to help the descendants of Abraham, fashioning a body for himself from a woman and sharing our flesh and blood, to enable us to see in him not only God, but also, by reason of this union, a man like ourselves. Happy New Year, yes, because with the first Sunday of Advent, we enter a new liturgical year. We will open over the Sundays, the Gospel of St. Mark. The word Advent means "coming". Who's coming? Even a kindergarten child can answer: the coming of Jesus. But "we know there are three came from the Lord," St. Bernard tells us in his fifth sermon for Advent. The third arrival is awaiting the return of Christ in glory. We sing at every Mass, after the consecration: "... until you come in glory." The major project of Jesus is to train with him in the Kingdom of God. Between the first and the third came, there a second. And that lap time is now. Every day the Lord comes, if we welcome. In order to receive, care must be taken, be vigilant. What is sure? To find out, open the Bible, the Book of Jeremiah 1, 11-12: "The word of the Lord came to me: What do you see, Jeremiah? I replied: I see an almond branch. Thou hast well seen: for I watch over my word to perform it. "In Hebrew, the root (ChaQaD) means both" see "and" almond. " In Hebrew, it is sure to be like the almond tree. For in the winter of the world where everything seems dead, where everything seems lost, here is the almond tree is the first to get to bloom. The watchman is one who announces the spring. He who waits in loving trust, and who is able to discern the signs of life and light to the cold of the night. Sure, it's also not knowing "when the master of the house will come back." Early in the book of Acts, Jesus meets his disciples who asked him if he will now restore the kingdom to Israel: "It is not yours to know times or seasons which the Father hath put in his sovereign freedom. But you will receive power when the Holy Spirit has come upon you "(Acts 1, 7-8a). You do not have to worry about times and the seasons. This is not your case. Why? First, in order not to sink into a hysterical anxiety "is the end of the world, the return of Christ ... should I be ready? "Then, to live confident faith is the opposite of clear vision. Watch! Four times the exhortation is repeated in today's Gospel. "Ah! If you rend the heavens! "Said Isaiah, while St. Paul adds, speaking of" hold firmly to the end. "The tone of this Advent begins is therefore given by the readings. Advent is the first time waiting for the Lord. "Come back," says Isaiah, "do not let us down" we might add in modern terms. The people turned away from God, he wanders on paths unknown and obscure. But our God, the prophet reminds us, is a faithful God, which responds to that which comes down to it, a God who comes to meet him who waits. This Advent, which begins today is given to us to awaken our expectations, our thirst for God. Because we are often watched by drowsiness, such as poor driver who has drunk too much and runs into the obstacle. Remain on our guard, be vigilant, live, as advised by Charles de Foucauld, "each day as if you were going to die tonight. " For God seems absent, as the man in the parable who went on a trip. God is "Wholly Other" that leaves us only apparently, not so much in misery, but to our responsibility as free people and adults. In our families, our businesses in the city and in the Church. But if he speaks of the absence, Jesus speaks more of his return. We walk to the meeting. That of the end of time, where, Lord, I see you face to face, and I shall know even as also I am known. But also that of the NOW, where God continues to come to us ... "but that night," as said one of the great poems of John of the Cross. Note as well, the gospel does not suggest a return at night, "the evening or at midnight, at cockcrow, or in the morning ..." Yet in the East, once he was virtually no way to travel night, as the insecurity of way was great. So to the symbolic meaning of the night that we must look to understand the night. Night is the time of darkness, those where sink Judas in the Gospel of John, those of the Passion, the time of temptation and trial. It is especially at night, he must remain vigilant. Ensure the night is expected in difficulties. This is to keep hope when all is black, his prayer is stammering when the winds are contrary. Is to receive from God the grace to hold on obscure, to stand when everything seems to crumble around us. God is there, hidden source, deaf forever, but at night, singing the Spanish mystic poet. And Edmond Rostand, who was not a saint, a special word in his "Chantecler": "The night it is good to believe in the light." For God comes every day, but always without warning! It is unexpected and surprising. Let us ready for the unexpected visits. This is the season of Advent. Become the watchers of the dawn divine, persevering in faith and charity attentive. "Do you know what it means to have a friend, to wait for him to come and see him soon? Do you know what it means to desire the passage of time, pending the arrival of someone who makes the heart beat? Do you know what it means to have a friend in the distance, waiting for his new, ask you, day after day, what it does right now, and it sure is strong ... in expectation of Christ is a feeling that like those. " We do not fix our affections on borrowed goods, because we know that they must soon be returned to the owner. All earthly goods are lent to us: it is folly to set our heart on what we must soon quit. Death shall strip us of all. The acquisitions and fortunes of this world all terminate in a dying grasp, in a funeral, in a descent into the grave. The house which you have built for yourself you must soon give up to others. Charity unites us to God. There is nothing mean in charity, nothing arrogant. Charity knows no schism, does not rebel, does all things in concord. In charity all the elect of God have been made perfect. He who has Jesus has everything." "Missionary of the American Frontier"
St Rose spent hours in adoration of our Eucharistic Lord. 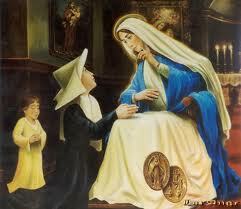 Sometimes her prayer would go long into the nighttime, spending 6 to 8 hours before the Blessed Sacrament. Her long hours of contemplation impelled the Potawatomi Indians whom she served to name her, Quah-kah-ka-num-ad, "Woman-Who-Prays-Always". It is said that the Native American children sneaked behind her as she knelt and sprinkled little pebbles (or acorns or leaves) on her long habit robe, and came back hours later (or even the following morning) to find them undisturbed. She wrote: "Once baptized, they never revert to drunkenness or stealing. Whatever is found is placed at the door of the church to be claimed by the owner. Not a single house has locks on the doors, yet nothing is ever missing. The Indians gather in groups (men and women separate) for morning prayers, Mass, and catechism. In the evening they assemble again for prayers." Mark 16:15 "Go into the whole world, and proclaim the Gospel to every creature"
Indian Catholic Youth Movement [ICYM] is the largest Premier Catholic Youth Organization recognized by CBCI. Spread across 601 Districts of India. The National network functions through 12 regions & 160 dioceses. Life is a constant Advent season: we are continually waiting to become, to discover, to complete, to fulfill. Hope, struggle, fear, expectation and fulfillment are all part of our Advent experience. The world is not as just, not as loving, not as whole as we know it can and should be. But the coming of Christ and his presence among us—as one of us—give us reason to live in hope: that light will shatter the darkness, that we can be liberated from our fears and prejudices, that we are never alone or abandoned. May this Advent season be a time for bringing hope, transformation and fulfillment into the Advent of our lives. 3 from which emerged four immense beasts, each different from the others. 4 The first was like a lion, but with eagle's wings. While I watched, the wings were plucked; it was raised from the ground to stand on two feet like a man, and given a human mind. 5 The second was like a bear; it was raised up on one side, and among the teeth in its mouth were three tusks. It was given the order, "Up, devour much flesh." 6 After this I looked and saw another beast, like a leopard; on its back were four wings like those of a bird, and it had four heads. To this beast dominion was given. 7 After this, in the visions of the night I saw the fourth beast, different from all the others, terrifying, horrible, and of extraordinary strength; it had great iron teeth with which it devoured and crushed, and what was left it trampled with its feet. 8 I was considering the ten horns it had, when suddenly another, a little horn, sprang out of their midst, and three of the previous horns were torn away to make room for it. This horn had eyes like a man, and a mouth that spoke arrogantly. 11 I watched, then, from the first of the arrogant words which the horn spoke, until the beast was slain and its body thrown into the fire to be burnt up. 12 The other beasts, which also lost their dominion, were granted a prolongation of life for a time and a season. 75 Mountains and hills, bless the Lord; praise and exalt him above all forever. 76 Everything growing from the earth, bless the Lord; praise and exalt him above all forever. 77 You springs, bless the Lord; praise and exalt him above all forever. 78 Seas and rivers, bless the Lord; praise and exalt him above all forever. 79 You dolphins and all water creatures, bless the Lord; praise and exalt him above all forever. 80 All you birds of the air, bless the Lord; praise and exalt him above all forever. 81 All you beasts, wild and tame, bless the Lord; praise and exalt him above all forever. in Thee that it may never be separated from Thee. even unto the complete sacrifice of my life." Bl Miguel Pro, ora pro nobis! In the 1920s the churches in Mexico were closed and priests went into hiding. Fr Pro spent the rest of his life in a secret ministry to the sturdy Mexican Catholics. In addition to fulfilling their spiritual needs, he also carried out the works of mercy by assisting the poor in Mexico City with their temporal needs. He adopted many interesting disguises in carrying out his secret ministry. He would come in the middle of the night dressed as a beggar to baptize infants, bless marriages and celebrate Mass. He would appear in jail dressed as a police officer to bring Holy Viaticum to condemned Catholics. When going to fashionable neighborhoods to procure for the poor, he would show up at the doorstep dressed as a fashionable businessman with a fresh flower on his lapel. His many exploits could rival those of the most daring spies. In all that he did, however, Fr. Pro remained obedient to his superiors and was filled with the joy of serving Christ, his King. At the time of the killing, Mexico was under the rule of the fiercely anti-clerical and anti-Catholic President Plutarco Elías Calles who had begun what writer Graham Greene called the "fiercest persecution of religion anywhere since the reign of Elizabeth." On the day of his execution, as Fr. Pro walked from his cell to the courtyard and the firing squad, he blessed the soldiers, knelt and briefly prayed quietly. Declining a blindfold, he faced his executioners with a crucifix in one hand and a rosary in the other and held his arms out in imitation of the crucified Christ and shouted out, "May God have mercy on you! May God bless you! Lord, Thou knowest that I am innocent! With all my heart I forgive my enemies!" Before the firing squad were ordered to shoot, Pro raised his arms in imitation of Christ and shouted the defiant cry of the Cristeros, "Viva Cristo Rey!" -"Long live Christ the King!" When the initial shots of the firing squad failed to kill him, a soldier shot him point blank. Calles had the execution meticulously photographed, and the newspapers throughout the country carried them on the front page the following day. Presumably, Calles thought that the sight of the pictures would frighten the Cristero rebels who were fighting against his troops, particularly in the state of Jalisco. However, they had the opposite effect. The Cristeros became more animated and fought with renewed enthusiasm, many of them carrying the newspaper photo of Pro before the firing squad. Miguel Pro's last request prior to execution was to be allowed to kneel and pray. Pro himself refused a blindfold. A Crucifix in the right hand, a rosary in the other. He blessed and forgave the firing squad. November 24, 1927, at the front of the Jesuit church of the Holy Family, a multitude accompanied the remains of Father Pro. Father Mendez Medina cried out, "Make way for the martyrs of Christ the King!" Although Calles had forbidden any public demonstration, the people acted in open defiance. Never had the city seen such an enormous turnout for a funeral. As the martyrs' caskets left the house, a great and unanimous cry soared from the hearts and mouths of thousands:.. "¡Viva Cristo Rey!" 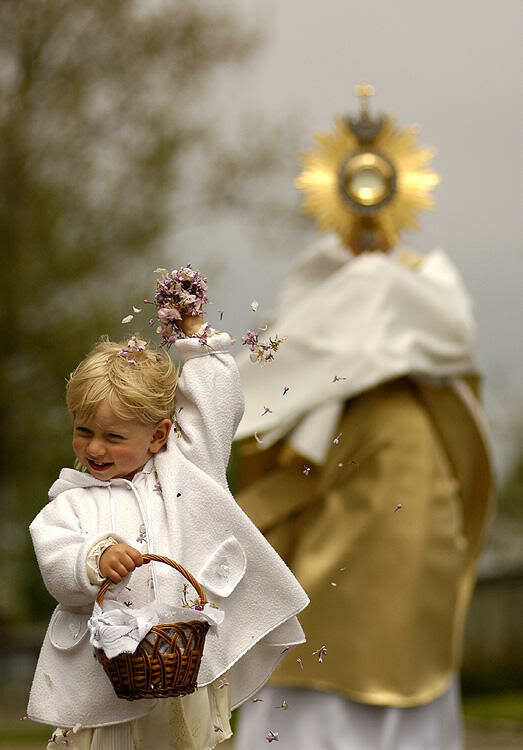 Thousands thronged the streets and balconies, throwing flowers, praying the rosary and singing. It was a triumph - a glorious witness to the heroism of martyrs for Christ the King. that my glory may sing your praise and not be silent . O lord my god, i will give thanks to you forever! 12 So these men rushed in and found Daniel praying and pleading before his God. 13 Then they went to remind the king about the prohibition: "Did you not decree, O king, that no one is to address a petition to god or man for thirty days, except to you, O king; otherwise he shall be cast into a den of lions?" The king answered them, "The decree is absolute, irrevocable under the Mede and Persian law." 14 To this they replied, "Daniel, the Jewish exile, has paid no attention to you, O king, or to the decree you issued; three times a day he offers his prayer." 15 The king was deeply grieved at this news and he made up his mind to save Daniel; he worked till sunset to rescue him. 16 But these men insisted. "Keep in mind, O king," they said, "that under the Mede and Persian law every royal prohibition or decree is irrevocable." 17 So the king ordered Daniel to be brought and cast into the lions' den. To Daniel he said, "May your God, whom you serve so constantly, save you." 18 To forestall any tampering, the king sealed with his own ring and the rings of the lords the stone that had been brought to block the opening of the den. 20 the king rose very early the next morning and hastened to the lions' den. 21 As he drew near, he cried out to Daniel sorrowfully, "O Daniel, servant of the living God, has the God whom you serve so constantly been able to save you from the lions?" 22 Daniel answered the king: "O king, live forever! 23 My God has sent his angel and closed the lions' mouths so that they have not hurt me. For I have been found innocent before him; neither to you have I done any harm, O king!" 24 This gave the king great joy. At his order Daniel was removed from the den, unhurt because he trusted in his God. 25 The king then ordered the men who had accused Daniel, along with their children and their wives, to be cast into the lions' den. Before they reached the bottom of the den, the lions overpowered them and crushed all their bones. 26 Then King Darius wrote to the nations and peoples of every language, wherever they dwell on the earth: "All peace to you! 27 I decree that throughout my royal domain the God of Daniel is to be reverenced and feared: "For he is the living God, enduring forever; his kingdom shall not be destroyed, and his dominion shall be without end. 28 He is a deliverer and savior, working signs and wonders in heaven and on earth, and he delivered Daniel from the lions' power." 69 Frost and chill, bless the Lord; praise and exalt him above all forever. 70 Ice and snow, bless the Lord; praise and exalt him above all forever. 71 Nights and days, bless the Lord; praise and exalt him above all forever. 72 Light and darkness, bless the Lord; praise and exalt him above all forever. 73 Lightnings and clouds, bless the Lord; praise and exalt him above all forever. 74 Let the earth bless the Lord, praise and exalt him above all forever. 20 "But when you see Jerusalem surrounded by armies, then know that its desolation has come near. 22 for these are days of vengeance, to fulfil all that is written. 24 they will fall by the edge of the sword, and be led captive among all nations; and Jerusalem will be trodden down by the Gentiles, until the times of the Gentiles are fulfilled. There is one Lord, Only of the Only, God of God, Image and Likeness of Deity, Efficient Word, Wisdom comprehensive of the constitution of all things, and Power formative of the whole creation, true Son of true Father, Invisible of Invisible, and Incorruptible of Incorruptible, and Immortal of Immortal and Eternal of Eternal. And there is One Holy Spirit, having His subsistence from God, and being made manifest by the Son, to wit to men: Image of the Son, Perfect Image of the Perfect; Life, the Cause of the living; Holy Fount; Sanctity, the Supplier, or Leader, of Sanctification; in whom is manifested God the Father, who is above all and in all, and God the Son, who is through all. We have collected together extracts from the Law and the Prophets relating to those things which have Been declared concerning our Lord Jesus Christ, that we may prove to your love that this Being is perfect reason, the Word of God; He who was begotten before the light; He who is Creator together with the Father; He who is the Fashioner of man; He who is all in all; He who among the patriarchs is Patriarch; He who in the law is the Law; among the priests, Chief Priest; among kings, the Ruler; among prophets, the Prophet; among the angels, Archangel; in the voice of the preacher, the Word; among spirits, the Spirit; in the Father, the Son; in God, God; King for ever and ever. Our Redeemer, ever present in the most Blessed Sacrament, extends His hand to everyone. He opens His heart and says, 'Come to Me, all of You.'" He says: A good tree, that is, a good heart as well as a soul on fire with charity, can do nothing but good and holy works. For this reason Saint Augustine said: "Love, and do what you will," namely, possess love and charity and then do what you will. It is as if he had said: Charity is not able to sin. 1 King Belshazzar gave a great banquet for a thousand of his lords, with whom he drank. 2 Under the influence of the wine, he ordered the gold and silver vessels which Nebuchadnezzar, his father, had taken from the temple in Jerusalem, to be brought in so that the king, his lords, his wives and his entertainers might drink from them. 4 wine from them, they praised their gods of gold and silver, bronze and iron, wood and stone. 6 his face blanched; his thoughts terrified him, his hip joints shook, and his knees knocked. 13 Then Daniel was brought into the presence of the king. The king asked him, "Are you the Daniel, the Jewish exile, whom my father, the king, brought from Judah? 14 I have heard that the spirit of God is in you, that you possess brilliant knowledge and extraordinary wisdom. 16 But I have heard that you can interpret dreams and solve difficulties; if you are able to read the writing and tell me what it means, you shall be clothed in purple, wear a gold collar about your neck, and be third in the government of the kingdom." 17 Daniel answered the king: "You may keep your gifts, or give your presents to someone else; but the writing I will read for you, O king, and tell you what it means. 23 you have rebelled against the Lord of heaven. You had the vessels of his temple brought before you, so that you and your nobles, your wives and your entertainers, might drink wine from them; and you praised the gods of silver and gold, bronze and iron, wood and stone, that neither see nor hear nor have intelligence. But the God in whose hand is your life breath and the whole course of your life, you did not glorify. 24 By him were the wrist and hand sent, and the writing set down. 28 PERES, your kingdom has been divided and given to the Medes and Persians." 62 Sun and moon, bless the Lord; praise and exalt him above all forever. 63 Stars of heaven, bless the Lord; praise and exalt him above all forever. 64 Every shower and dew, bless the Lord; praise and exalt him above all forever. 65 All you winds, bless the Lord; praise and exalt him above all forever. 66 Fire and heat, bless the Lord; praise and exalt him above all forever. 67 Cold and chill, bless the Lord; praise and exalt him above all forever. 31 "In your vision, O king, you saw a statue, very large and exceedingly bright, terrifying in appearance as it stood before you. 33 the legs iron, its feet partly iron and partly tile. 34 While you looked at the statue, a stone which was hewn from a mountain without a hand being put to it, struck its iron and tile feet, breaking them in pieces. 35 The iron, tile, bronze, silver, and gold all crumbled at once, fine as the chaff on the threshing floor in summer, and the wind blew them away without leaving a trace. But the stone that struck the statue became a great mountain and filled the whole earth. 36 "This was the dream; the interpretation we shall also give in the king's presence. 38 men, wild beasts, and birds of the air, wherever they may dwell, he has handed over to you, making you ruler over them all; you are the head of gold. 39 Another kingdom shall take your place, inferior to yours, then a third kingdom, of bronze, which shall rule over the whole earth. 40 There shall be a fourth kingdom, strong as iron; it shall break in pieces and subdue all these others, just as iron breaks in pieces and crushes everything else. 42 and the toes partly iron and partly tile, the kingdom shall be partly strong and partly fragile. 43 The iron mixed with clay tile means that they shall seal their alliances by intermarriage, but they shall not stay united, any more than iron mixes with clay. 44 In the lifetime of those kings the God of heaven will set up a kingdom that shall never be destroyed or delivered up to another people; rather, it shall break in pieces all these kingdoms and put an end to them, and it shall stand forever. 45 That is the meaning of the stone you saw hewn from the mountain without a hand being put to it, which broke in pieces the tile, iron, bronze, silver, and gold. The great God has revealed to the king what shall be in the future; this is exactly what you dreamed, and its meaning is sure." 57 Bless the Lord, all you works of the Lord, praise and exalt him above all forever. 58 Angels of the Lord, bless the Lord, praise and exalt him above all forever. 59 You heavens, bless the Lord, praise and exalt him above all forever. 60 All you waters above the heavens, bless the Lord, praise and exalt him above all forever. 61 All you hosts of the Lord, bless the Lord; praise and exalt him above all forever. 6 "As for these things which you see, the days will come when there shall not be left here one stone upon another that will not be thrown down." 7 And they asked him, "Teacher, when will this be, and what will be the sign when this is about to take place?" 8 And he said, "Take heed that you are not led astray; for many will come in my name, saying, `I am he!' and, `The time is at hand!' Do not go after them. 9 And when you hear of wars and tumults, do not be terrified; for this must first take place, but the end will not be at once." 11 there will be great earthquakes, and in various places famines and pestilences; and there will be terrors and great signs from heaven. 1 In the third year of the reign of Jehoiakim, king of Judah, King Nebuchadnezzar of Babylon came and laid siege to Jerusalem. 2 The Lord handed over to him Jehoiakim, king of Judah, and some of the vessels of the temple of God, which he carried off to the land of Shinar, * and placed in the temple treasury of his god. 5 after three years' training they were to enter the king's service. The king allotted them a daily portion of food and wine from the royal table. 6 Among these were men of Judah: Daniel, Hananiah, Mishael, and Azariah. 8 But Daniel was resolved not to defile himself with the king's food or wine; so he begged the chief chamberlain to spare him this defilement. 10 he nevertheless said to Daniel, "I am afraid of my lord the king; it is he who allotted your food and drink. If he sees that you look wretched by comparison with the other young men of your age, you will endanger my life with the king." 12 "Please test your servants for ten days. Give us vegetables to eat and water to drink. 13 Then see how we look in comparison with the other young men who eat from the royal table, and treat your servants according to what you see." 15 after ten days they looked healthier and better fed than any of the young men who ate from the royal table. 16 So the steward continued to take away the food and wine they were to receive, and gave them vegetables. 17 To these four young men God gave knowledge and proficiency in all literature and science, and to Daniel the understanding of all visions and dreams. 18 At the end of the time the king had specified for their preparation, the chief chamberlain brought them before Nebuchadnezzar. 19 When the king had spoken with all of them, none was found equal to Daniel, Hananiah, Mishael, and Azariah; and so they entered the king's service. 20 In any question of wisdom or prudence which the king put to them, he found them ten times better than all the magicians and enchanters in his kingdom. 52 "Blessed are you, O Lord, the God of our fathers, praiseworthy and exalted above all forever; And blessed is your holy and glorious name, praiseworthy and exalted above all for all ages. 53 Blessed are you in the temple of your holy glory, praiseworthy and glorious above all forever. 54 Blessed are you on the throne of your kingdom, praiseworthy and exalted above all forever. 55 Blessed are you who look into the depths from your throne upon the cherubim, praiseworthy and exalted above all forever. 56 Blessed are you in the firmament of heaven, praiseworthy and glorious forever. 11 "For thus says the Lord GOD: Behold, I, I myself will search for my sheep, and will seek them out. 12 As a shepherd seeks out his flock when some of his sheep have been scattered abroad, so will I seek out my sheep; and I will rescue them from all places where they have been scattered on a day of clouds and thick darkness. 15 I myself will be the shepherd of my sheep, and I will make them lie down, says the Lord GOD. 16 I will seek the lost, and I will bring back the strayed, and I will bind up the crippled, and I will strengthen the weak, and the fat and the strong I will watch over; I will feed them in justice. 17 "As for you, my flock, thus says the Lord GOD: Behold, I judge between sheep and sheep, rams and he-goats. 28 When all things are subjected to him, then the Son himself will also be subjected to him who put all things under him, that God may be everything to every one. 1 King Antiochus was going through the upper provinces when he heard that Elymais in Persia was a city famed for its wealth in silver and gold. 2 Its temple was very rich, containing golden shields, breastplates, and weapons left there by Alexander, the son of Philip, the Macedonian king who first reigned over the Greeks. 4 and they withstood him in battle. So he fled and in great grief departed from there to return to Babylon. 7 that they had torn down the abomination which he had erected upon the altar in Jerusalem; and that they had surrounded the sanctuary with high walls as before, and also Beth-zur, his city. 8 When the king heard this news, he was astounded and badly shaken. He took to his bed and became sick from grief, because things had not turned out for him as he had planned. 9 He lay there for many days, because deep grief continually gripped him, and he concluded that he was dying. 10 So he called all his friends and said to them, "Sleep departs from my eyes and I am downhearted with worry. 12 But now I remember the evils I did in Jerusalem. I seized all her vessels of silver and gold; and I sent to destroy the inhabitants of Judah without good reason. 13 I know that it is because of this that these evils have come upon me; and behold, I am perishing of deep grief in a strange land." 2 I will be glad and exult in thee, I will sing praise to thy name, O Most High. 3 When my enemies turned back, they stumbled and perished before thee. 4 For thou hast maintained my just cause; thou hast sat on the throne giving righteous judgment. 6 The enemy have vanished in everlasting ruins; their cities thou hast rooted out; the very memory of them has perished. 19 Arise, O LORD! Let not man prevail; let the nations be judged before thee! 28 and they asked him a question, saying, "Teacher, Moses wrote for us that if a man's brother dies, having a wife but no children, the man must take the wife and raise up children for his brother. 31 and the third took her, and likewise all seven left no children and died. 33 In the resurrection, therefore, whose wife will the woman be? For the seven had her as wife." 36 for they cannot die any more, because they are equal to angels and are sons of God, being sons of the resurrection. 37 But that the dead are raised, even Moses showed, in the passage about the bush, where he calls the Lord the God of Abraham and the God of Isaac and the God of Jacob. 38 Now he is not God of the dead, but of the living; for all live to him." 39 And some of the scribes answered, "Teacher, you have spoken well." 40 For they no longer dared to ask him any question.